Great location and everyone was super friendly! Dr. Bryant was very knowledgeable and approachable, he gave recommendationswithout being pushy. I loved that he had his dogs wandering the office, it made me more relaxed and not really think about why I was there! Great location and everyone was super friendly! Dr. Bryant was very knowledgeable and approachable, he gave recommendations without being pushy. I loved that he had his dogs wanderingthe office, it made me more relaxed and not really think about why I was there! Dr. David Bryant hails from Golden, Colorado. He attended college at St. Leo University in Florida and then returned home to earn his Doctor of Dental Surgery (DDS) degree from the University of Colorado. 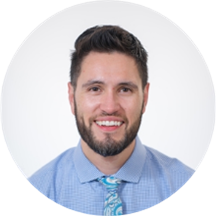 He undertook a post-graduate residency in Alamosa, Colorado where he received AEGD (Advanced Education in General Dentistry) training from Lutheran Medical Center. In Denver he cared for patients at the University of Colorado, the Colorado Coalition for the Homeless, and served several years on the board of the Howard Dental Center, a non-profit HIV/AIDS clinic. When Dr. Bryant isn’t helping people maintain healthy smiles, he enjoys ice hockey, playing with his dogs, and spending time in the mountains. My experience was great. Dr. David and all the employees at his practice are extremely professional, kind, and informative. The office is impeccably clean, they are completely green and do all paperwork digitally, and they have adorable therapydogs! Dr. David explained all the procedures thoroughly to me before going through with anything which was very helpful. I highly recommend this dental practice! Great staff all around. Everyone was very friendly, funny, and patient with me as I sorted out my confusion with my own insurance coverage. Awesome experience! Doctor and staff were amazing. Highly recommended! Dr. Bryant is an excellent dentist with a superb staff. For once in my life, I do not fear going to see the dentist. Please keep up the great work and please make Dr. Bryant you dentist. He was very informative and offered a treatment plan that I was very impressed with and happy with. Dr. David Bryant was very professional and clearly knows exactly what he is doing and talking about. He provided me with great service and care and was still able to keep the appointment light and friendly. The other members of histeam, especially Amanda, were a pleasure to work with and have always been extremely polite and professional. I would highly recommend South Shore Dental and Dr. David Bryant's team to any of my friends or family. Professional office and staff. Dr. Bryant was very thorough and took time explaining things. I would highly recommend this office to anyone! Just had my first appointment with Dr. Bryant and was very impressed from beginning to end. The staff is very friendly, and the office itself leaves a great first impression with a calming atmosphere and advanced equipment. Dr. Bryant was thoroughand patient in explaining the purpose of each procedure and how to plan for the long-term health of my teeth and gums, and clearly has his patients' best interests in mind. I was nervous moving to Denver and having to find a brand new dentist. ZocDoc led me in the right direction in Boston, so I decided to give it a try here and I am glad I did. The office isbrand new, clean, and everything is digital. The staff was friendly, accommodating, an explained everything they were doing. Dr. Bryant was professional, knowledgeable and gave excellent advice. After this appointment, I know I have found a good dentist in Denver and I plan on continuing to visit Dr. Bryant. Very professional and thorough. Dr. Bryant and staff are friendly and put me at ease. A very positive experience. The entire staff was great. They were very thorough and informative. Overall a positive and pleasant experience - I highly recommend. I had a great experience with Dr. Bryant. Him and all of his associates were very thorough and took my step-by-step through my treatment plan, so there were no surprises.